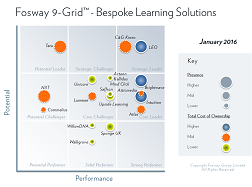 The Fosway 9-Grids™ provide a unique assessment of the principal learning and talent supply options available to organisations in EMEA. Now in its fourth year, the analysis is based on extensive independent research and insights from Fosway’s Corporate Research Network of over 150 customer organisations, including BP, HSBC, PwC, RBS, Sanofi, Shell and Vodafone. The analysis is designed to provide much needed context to organisations investing in learning technology. The 9-Grids™ uniquely capture five different levels of insight into a vendor’s position in the market, highlighting their Performance, Potential, Market Presence, Total Cost of Ownership and expectations of their Future Trajectory. The latest 9-Grids™ for 2016 are freely available to download now.